Almost everyone wants to have a large gorgeous house with big rooms, but only few of us have such a chance. Perhaps, the most public and family room of the house is the lounge. Given that most people spend their evenings in this very room, it’s important for it to be spacious enough. And many people wonder how to make a small room seem bigger. Let’s see how this effect can be created on few square meters by means of golden designer tricks. Designers keep teaching us again and again that dark color schemes make rooms seem smaller, while light hues can expand a tiny place visually. Make sure you follow this golden rule, and you will never go wrong. Make your ceiling and walls light, perhaps, even white. This will blur the borders of the room, and its interior will get an airier and fresher look. One more win-win option is using cold pastel hues of blue and green, which can make the distance between different items in the room seem bigger. A small lounge is very demanding when it comes to choosing the furnishing. To unload the space a little bit, pay your special attention to multifunctional models and transforming pieces of furniture, which are irreplaceable in saving real and visual space. For instance, a small coffee table can be turned into a full-fledged dining one, and a bookcase can serve as a bench at the same time. Thinking that one bright source of artificial ligth would be enough for a small room is a fundamental misunderstanding. Designers believe that it’s worth having at least three types of lighting sources in the room: ceiling, local and decorative ones. Light brought by floor, desk and wall lamps, as well as multilevel directed light in different room areas also contribute to visual space expansion. An efficient way to make the living room appear bigger is the use of mirrors and reflective glossy surfaces. Besides, mirrors are essential, when it comes to diffusing light, which is also a nice option for small rooms. But you shouldn’t limit yourself to conventional mirrors hung on the walls. Opt for an interesting interior partition with mirror insertions or a glass coffee table, which wouldn’t take much place. Plain and laconic lines are more than welcome in small living rooms, as well as ottomans, coffee tables and other low pieces of furniture. 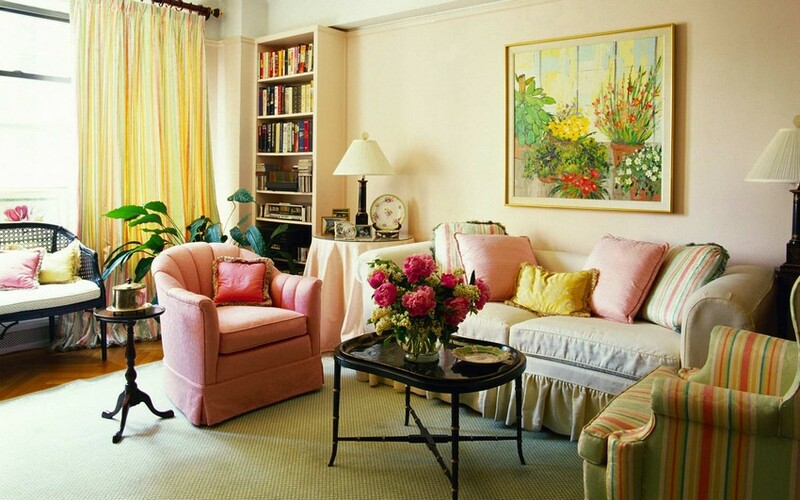 Furnishing a small room with bulky pieces you create an imbalance. Consider buying a medium-sized couch and a couple of compact arm-chairs instead of a big sofa. Many people tend to make impulsive purchases. But it’s worth buying only those things that you really can’t do without, especially when your room area is limited. Keep only memorable details and dear photos. Vertical elements, which lead our glance up to the ceiling, creating an illusion of its big height, are just irreplaceable in tiny rooms. These can be a narrow full-length mirror, curtains hanging on a recessed rod by the ceiling, or tall floor lamps.